News Yaroslavl. Independent view on developments in Russia and Yaroslavl. Journalist Victoria Sotskova. SOTSCOVA.COM — independent look at events in Russia and Yaroslavl. This is everyday news and independent commentaries. Victoria Sotscova is a journalist and a public figure. Her blog will help you learn more about Russia and political, cultural and social priorities of its citizens. 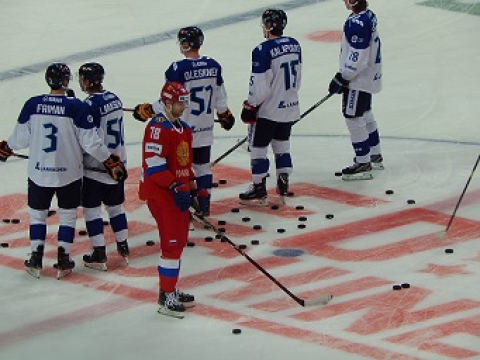 07.02.2019 The rendered match took place as part of the Euro Hockey Tour stage between the national teams of Russia and Finland in Yaroslavl, which ended in victory for the Russian team. 06.02.2019 The exhibition «Tsigale Sculptors Dynasty» exhibition opened in the Yaroslavl Museum of Modern Art. It contains exhibits of different generations of the creative dynasty, which includes sculptors, artists and cultural figures. On November 14, 2018 for the fifth time, an exhibition of participants and winners of the children's drawing competition «My grandma and I have been good friends for a long time, she is in all my ventures with me». was opened in the Yaroslavl City Palace of Pioneers. The inspirer and organizer of the project is the Children's School of Osteoporosis Prevention on the basis of the «Osteorus» Methodological Center of the Russian Patient Society «Osteorus». From September 19 to September 21, the Eurasian Womens Forum worked in St. Petersburg. This is an important platform for discussing the role of women in modern society and their health. It was attended by representatives of more than 110 countries. The osteoporosis awareness event will be held at the Public Library named after A.P. Chekhov on October ,11 at 3p.m. in Yaroslavl, Russia. Russia is a leading market for high-power data centers in Central and Eastern Europe, and therefore it is important to establish perfect operational processes for complex integrated systems of data centers.